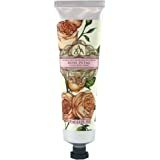 The delicate Rose Petal aroma is perfect for a light, floral everyday scent. Foam Bath. Floral Fragrance. Pour approx. 25ml per bath under warm running water. 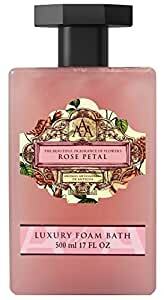 5.0 out of 5 starsThe loveliest rose scented bath product I've ever used! I bought this because I am a huge orange blossom fan. This product is disappointing. It's very light, mild, and mostly chemical perfume. It smells mild and the scent doesn't last. Doesn't feel particularly anything. However, what bothered me the most was, when I looked at the ingredients, it contains artificial colors. And another reminder, it's made in China. I do not think this says much about a great reputation. Perfume + colors, such a watery bath gel. I won't buy it again. I really love this stuff! It has a gorgeous lilac scent. It does not produce huge amounts of bubbles but for me this is greatly outweighed by its wonderful and accurate scent. The bubble bath smells very beautiful. 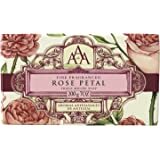 A very pronounced, not cheap smelling, rich rose scent. Consistency (the liquid) of the bubble bath isn't watered down or low quality whatsoever. The lather is excellent, creates a great amount of suds per suggested use on the bottle (1 cap). 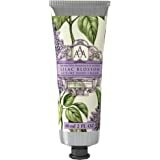 If you are a fan of anything rose scented, and want a more luxurious product, go with this. It's definitely worth the money for a enjoyable stress relief time for yourself. Being from New York, I'd always had lilac bushes and they are one of my favorite flowers. Living now if California, I can't get them. It was nice to bathe with the remembered scent that I loved so well.